Seattle's myriad neighborhood cafes serve as our substitute homes and offices. Every day, people spend hours within their coffee-scented walls, having meetings, reading books, answering e-mails, plugged into personal devices—simultaneously alone and together. Cafes are where we go for comfort and caffeine, but not necessarily for nourishment. Sustenance is typically a damp premade sandwich or salad, a soggy spinach-and-feta croissant, or a day-old scone. But not anymore. Over the last year, four notable cafes have opened up in neighborhoods across the city. They offer the requisite coffee, espresso drinks, and pastries, but also solid food menus rooted in delicious, high quality—and often local—ingredients. Even if you don't live around the corner from these places, you'd be wise to seek them out. With just its name, Greenwood's Preserve and Gather makes its intentions clear. There's no wi-fi here; gathering goes better without it. In the morning, there's a rotating selection of freshly baked pastries (both sweet and savory), as well as house-made yogurt and toast topped with homemade fruit preserves such as chai tea pear butter and rhubarb orange jam. The bread is baked in cast-iron pans by esteemed Sea Wolf Bakers, who also supply the bread for all of award-winning chef Renee Erickson's restaurants. In the afternoon, there are savory toasts, salads, and platters of meats, cheeses, and pickles. Ricotta toast ($4) is a satisfying snack: enormous slices of chewy, crumby bread cut into triangles and slathered with fresh, almost runny, ricotta. The mild cheese has a lovely quivering texture that exists somewhere between liquid and cream. Local wildflower honey, artfully drizzled on in a diagonal pattern, adds a complex sweetness. In the late afternoon, large batches of Preserve and Gather's pickles are made, and the air in the cafe grows astringent from all the vinegar being brought to a boil. It's bracing but also thrilling—an inescapable reminder of the reality of taking the time to make things by hand. On the opposite end of the city, the folks at Redwing Cafe in Rainier Beach also spend every morning baking pastries and updating their chalkboard menu with the day's particular muffins, scones, quiches, frittatas, and soups. Meanwhile, outside, a giant red-winged bird on the side of the building (built by a neighborhood artist, of course) invites people in to eat "Earth food for Earth people." The cafe's breakfasts include a roasted vegetable hash, biscuits and gravy, and house-made granola. In the afternoon, there are simple sandwiches such as grilled cheddar with tomato slices and "PB&J" made with organic peanut butter and raspberry jam. Try as I might, I can never stop myself from ordering the Harambe salad ($10), a big bowl of mixed greens topped with lovingly grated carrots, daikon radish, beets, and purple cabbage. The shredded vegetables provide earthy, sweet, and spicy notes, while toasted pumpkin seeds add a nutty crunch. Redwing's house dressing is a bright and deeply savory lemon-tahini sauce that follows the recipe of Seattle's dearly departed Gravity Bar. Anyone who used to frequent Gravity Bar will recognize the flavor immediately. Order a side of tea-smoked tofu ($3), thin slices of which are griddled and served warm and crispy, for an extra dose of health-food nostalgia. If Redwing harks back a bit to Seattle's past, downtown's Mr. West looks decidedly forward. It's a sleek and modern cafe—lots of marble, glass, and dark wood—that gives the neighborhood exactly what it's been needing: a spacious and well-designed place that invites people to linger. The menu is on trend with the rest of the city's new cafes: toasts, salads, sandwiches, cheese and charcuterie platters, as well as build-your-own pickle plates. But there are also some flourishes of real creativity here: A veggie sandwich is anchored by a spiced carrot spread, while toast takes a trip to South Asia and comes adorned with chunks of avocado that are dressed with curry powder, mustard seed, and lime. Bowls of Greek yogurt, offered from 7 a.m. to 4 p.m., are a blank canvas for the kitchen's inspired ideas. The "No. 3" is an unexpected savory dish—thick, tangy yogurt topped with the nutty grain farro, a Greek herb pistou that's heavy on musky, sweet oregano, slices of salty preserved lemon, and a dusting of spicy, fruity Aleppo pepper. There's honey in the mix, too, which makes it just a touch too sweet, but still delectable. Mr. West is owned by the same folks behind Bottlehouse, a wine shop/wine bar/restaurant that's beloved by Madrona residents. The cafe serves a generous number of wines, as well as cocktails made with wines and beers. Indicative of its careful design, the menu at Mr. West, which is open until 10 p.m., transitions effortlessly from cafe to bar, morning into night. If there's one cafe in town that I'd go far out of my way to eat at anytime, it's Capitol Hill's Peloton Bicycle Shop & Cafe. (I'll get to the bike part in a moment.) Chef and co-owner Mckenzie Hart puts out plate after plate of beautiful food that is rooted in the Pacific Northwest and its seasons, but also the uninhibited, creative energy that defines Seattle at its best. Hart worked for Matt Dillon at both London Plane and Sitka & Spruce, as well as at Cafe Presse, and her experience shows. She's not afraid of spices and seasoning, but she cooks with an understanding and restraint that amplifies the natural flavors of her ingredients. A recent daily special ($13) featured wild Oregon tuna, lightly marinated in soy, atop a bed of spicy baby greens from City Grown Seattle. Shredded carrot and sugar snap peas gave sweetness and crunch, while shaved radishes added peppery depth. A ginger-soy dressing punched up the flavor without being overbearing, while a perfect six-minute egg bathed the dish in golden richness. Another salad, this one made with spinach, English peas, and rounds of shaved raw asparagus ($10), was a celebratory riot of green. Dense purple and yellow marble potatoes gave the dish heft, goat cheese gave creaminess, and a potent mustard-seed dressing coated everything with a lively tang. A shower of parsley leaves, much more than a garnish, added a welcome whisper of bitterness. Last week's vegetable hash ($12), which two months ago was made from winter's hearty root vegetables, reflected the current season's produce, a tender mix of varying shades of green. Leeks and fennel were roasted into soft, slippery submission, along with romanesco. Brussels sprouts, cut in half and blackened on one side until they were almost burned, lent a smoky, charred flavor. They were all tossed with parsley leaves and fingerling potatoes, then dotted with chèvre and a chipotle aioli. The chèvre melted into a warm and gooey sauce that commingled with two runny egg yolks. The whole thing was spicy, silky, rich, and wholly comforting. 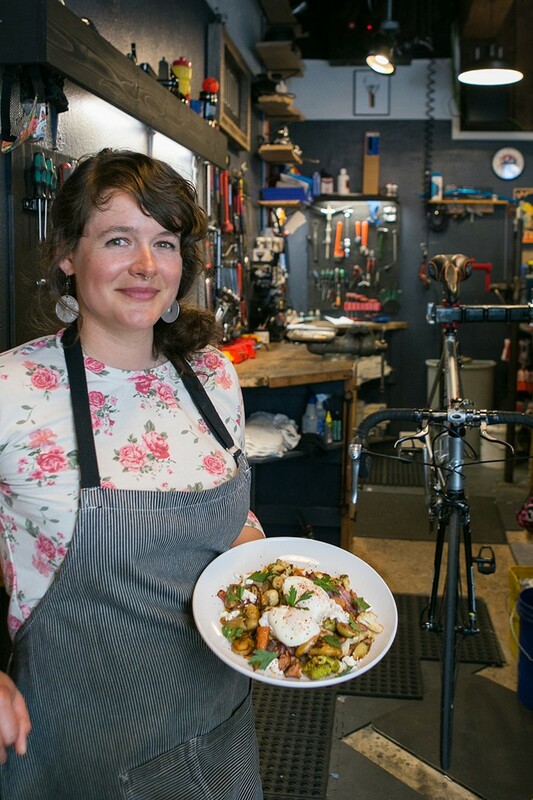 Peloton is a unique business, as much a bike shop as cafe. You can get your brakes fixed or buy a helmet while having some avocado toast or a pint of beer. Seattle's cafe scene is strong, but so is its bike-polo culture, as evidenced by the conversations I was surrounded by on a recent visit. For a moment I felt as though I didn't belong, but as I looked down at the gorgeous pile of vegetables in front of me, mostly I felt grateful for a small space that can hold so much.